Next Friday, October 24th, marks the 20th anniversary of Choice One Engineering. It also marks the 20th anniversary of Jeff Puthoff’s awesome African safari tie (or are those eagles, Jeff?). Some of the “young punks” here, as Jeff would call them, don’t know a Choice One without Jeff’s gray hair, everyday green shirts, and afternoon coffee. Heck, they don’t even remember the typewriter and the fax machine. The Sidney/Shelby County area code was 513 and not 937. Those of us old enough to remember 513 can probably recall what a big deal the change was, especially when dialing on a rotary phone. Dialing “937” took so much longer! The internet, email, and cell phones were still just the “next big thing,” just like wipe warmers and Diaper Genies are nowadays. Brian “Barney” Barhorst was still a humble resident of Fort Loramie and not Minster. Our Loveland office space was a Clermont County branch of the Bureau of Motor Vehicles. Some Choice One employees (such as summer help Camille and co-op Lexi) weren’t even born yet. If you’d like to take a walk down the Choice One memory lane with us, check out more photos here. 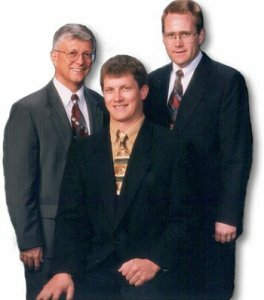 You’ll see a little less gray hair and a few more eagle/safari ties, but we hope you notice that the spirit of Choice One in place in 1994 has only grown in the past 20 years. Thanks to everyone–clients, spouses, families, advisers, and friends–who has helped us along the way. Here’s to another 20 years of enjoyment.